A Biddy Full Day, bby local-area playwright. Photo courtesy of Habersham Community Theater. The Habersham Community Theater (HCT) has been around for over 30 years, and is still growing. Providing a space for local residents to not only enjoy theater, but to experience it first hand, as well. Surrounding the HCT are kind, inspiring, and knowledgeable people that were willing to share the rich history of HCT, as well as this season's lineup. 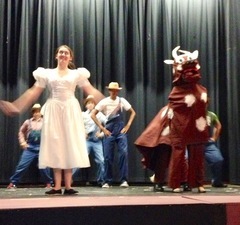 After having had a wonderful time joining with Habersham Central High School Fine Arts Department in the production of the musicals, Li’l Abner,’80, Fiddler on the Roof ,‘81, and Oklahoma, ‘82, residents from the area considered organizing a community theater. The idea was encouraged by Tom McCleary, Artist in Residence at the high school. He served as guide and mentor for the fifty-three citizens and business owners who began Habersham Community Theater, Inc. in 1982, a not-for-profit organization to promote the performing arts. Boards of Directors through the years have striven to ever improve the productions and business operations of the theater. Three shows a year were the norm until the 1986-87 season when four shows were slated. Performances were usually presented at either the theater in Tallulah Falls School, Jenkins at Piedmont College, Habersham Central High School, or the Grand Theatre in Cornelia. Since its inception, one of the goals of HCT had been to find a theater home. HCT at Home in 1999! In 1999 this long-held dream of a home of its own was finally realized. HCT purchased the historic 1937 movie theater in Clarkesville. The Board of Directors undertook a visionary renovation and restoration project to provide an appealing theater home. John Kollock designed the stage space as he had for other potential purchases. The first show in the “new” theater was Charlotte’s Web. The stage was small and seating was green plastic chairs, but enthusiasm and creativity were high. Restoration of the Art Deco facade was completed in March of 2002. Grants and donations from the community made this possible. HCT assumed a loan of $123,000 at three percent interest from the Georgia Cities Foundation through the Downtown Development Authority of the City of Clarkesville. H & M Maintenance Support, Inc. began a major renovation in June of 2004 and completed the work early in October. A much larger stage, new tech booth, the original raked floors, and new seating were among the comfortable improvements. Many original aspects of the Historic Habersham Theater have been preserved. In 2004 the theater proudly opened its beautiful renovation with the musical Guys and Dolls. Continuing HCT’s dedication to providing an excellent theater experience, many more improvements have been made since including a new roof, loft over the stage right wing, new basic lighting equipment, donated carpeting in the dressing rooms and meeting room, beautiful new restrooms and a stage left wing with second floor storage area and loading dock in the donated alley space. In 2011, HCT was a recipient of A Clarkesville Better Hometown grant to refresh the façade. Other improvements have been made to the sound system, lighting capacity, and equipment. During the 2013-2014 season, a major project retired the remaining $50,000 of the mortgage! Next on the list of enhancements for viewing pleasure is a plan for new theater seating. Mission Statement: The mission of HCT is to provide live entertainment, to offer opportunities for personal growth through use of creative talents in drama, music, art, and dance; to contribute to the cultural enrichment of the community; and to share emotions that enrich our perceptions of life and our understanding of others. A wide variety of programs always have been a part of HCT’s offerings. One-acts, various acting workshops, programs for local schools, civic groups, and festivals, children’s theater, concerts, dance recitals, and art displays have been a part of the events. Six major productions of plays and musicals now comprise the regular season of September 1–August 31. 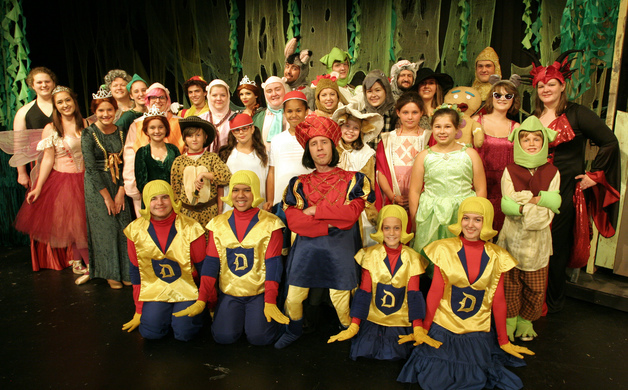 HCT Children’s Theater, an important wing of the theater mounting plays and summer workshops for children, began in the summer of 2007. HCT has been proud to provide a solid footing in theater for several youngsters who have gone on to become professional actors/singers. Many volunteers work on and off stage building sets, painting, handling props, working with storage in the theater and in the rented warehouse, and maintenance of the building as well as acting on stage. Others work with lighting designs, sound systems, prepare items for concessions, sew costumes, organize costumes and props, serve on the Board of Directors, prepare playbills, publicity, website, and in many other of the myriad capacities that are necessary to run the theater organization and its productions. Since HCT is entirely a volunteer organization, our volunteers are invaluable in enabling us to serve the community. HCT has been blessed with strong community support through funding from individuals, businesses, and foundations. As a 501(c)3 not-for-profit organization, its life depends on those interested in enhancing the cultural life in our community and who enjoy the possibilities that live theater offers. In an effort to give back to the community in ways other than the production of live plays, HCT has hosted fund-raisers for local charities such as the Habersham County United Way, local charities providing food, clothing and housing to those in need and the local animal shelter. For more information on how you can get involved, visit their website here.